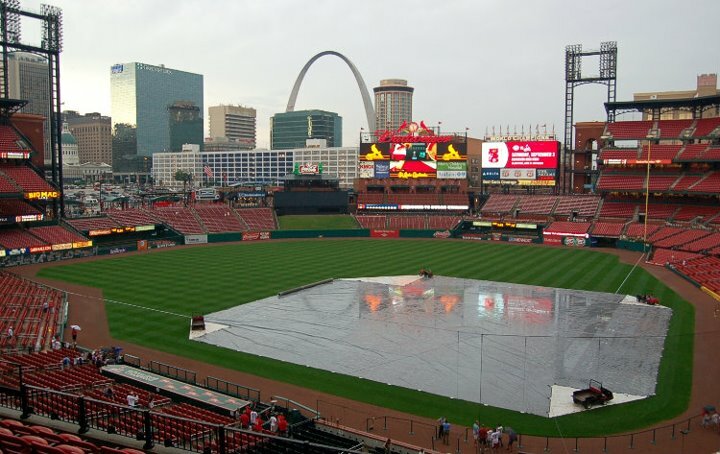 Will The Real St. Louis Cardinals Please Stand Up? I’ve never liked roller coasters. No, really. I refused to set foot on one until I was in the 8th grade. That topsy-turvy, pit-in-your-stomach, inexplicable shaking just didn’t seem like fun to me. Unfortunately, roller coaster rides are simply part of being a sports fan. More specifically, being a baseball fan of a team on the brink of making an improbable post season run. Wednesday night’s win that brought the Cardinals to within 1.5 games of the wild card lead was the top of the hill — the emotional high before you plummet to the bottom at a speed that defies all reason. Thursday’s afternoon game could have capped off a sweep to set up the perfect final week. Wednesday’s high spirits were dampened … but not because of the rain. Perhaps the 2 hour and 19 minute rain delay should have been the first clue — things were a little off. The hope was, the momentum the Redbirds had found would carry through regardless, and when the first inning finally began, that seemed to be the case. Jake Westbrook earned three outs on six pitches. Then, Allen Craig — filling in yet again for Matt Holliday — blasted a two-run homer to put the Cardinals in front early. Minus a few doubles here and there, things remained fairly quiet until the fifth inning. After one quick out, Westbrook gave up back-to-back singles to Josh Thole and Mike Baxter. After striking out his counterpart in Chris Capuano, he unintentionally-intentionally walked Jose Reyes to load the bases. I have to assume the walk to Ruben Tejada on five pitches really was unintentional, because it put the Mets on the board. One-run game. Again. Here comes another loop-de-loop. Not to be outdone, the Cards came back with some fifth inning fireworks of their own — once again, with two outs. Albert blasted home run No. 37 to left field (that’s RBI No. 98, for those keeping track) and Yadier Molina tied his career high 62 RBI on a single, scoring Lance Berkman. In the seventh, Yadi eclipsed that RBI mark doubling to score Daniel Descalso (pinch running for David Freese). And you know things are going well when Tyler Greene gets a chance … and comes through with an RBI single of his own! That made it 6-1 St. Louis. The way this roller coaster has been charging ahead, things looked good. New York scored a single run in the eighth. No biggie. Okay, it was kind of a big deal because of how they scored. Ruben Tejada singled, but advanced on an error by Adron Chambers. He advanced again on a wild pitch by Octavio Dotel. Tejada finally scored … on a passed ball. Remember Wednesday’s sloppy inning? The Mets scored four. I only wish this had been the sloppy inning. For some reason, Tony La Russa decided it was a good idea to rely on Jason Motte once again. Not that the idea is a bad one, but it might be a little overused. He has pitched in 12 games since September began and his perfect 0.00 ERA from July and August is now over five. Motte walked the lead off guy (who just had to be Willie Harris), only to get a double play ball out of Nick Evans. At least it should have been. But Rafael Furcal made his fifth error in six games and nobody was out. After walking the bases loaded with one out, Motte walked in yet another New York run. Marc Rzepczynski entered the game with the task of pitching to Jose Reyes. Scrabble threw just two pitches. That’s all Reyes needed to line one to right field, adding the third run of the inning. Before it was all said and done, Fernando Salas gave up the go ahead runs to — you guessed it — Willie Harris. The loop-de-loop turned into a nose dive, and there was nothing anyone could do. Eight to six, Mets. The result, a dazed and confused Cardinal Nation. Did the August version of the 2011 club decide to give it one last go? Or did the September squad just hit a snag? Of course, he’s right. The Cardinals now sit two games behind the Braves. The remaining schedule has the Redbirds facing two very beatable (dare I say sweep-able?) teams in the Cubs and the Astros. As long as they can hang on through this loop, they still have a good chance. As good a chance as it would have been sitting one game back? No. But better than it was just one short week ago? By far. Oh, and you know what I’ve learned about roller coasters? Even if I close my eyes, white-knuckle the safety bar, and scream a little, I always want to ride again afterwards. We’re playing meaningful baseball the final week of September! Even if I can’t watch (or breathe! ), I wouldn’t have it any other way. These *are* the real St. Louis Cardinals! The “August version” that got swept by the Dodgers are, with the exception of the few call-ups, the “September squad” — same team, different results, yet still the same approach to going out every day and trying to win. True. But they do have a sort of Jekyll and Hyde thing going on this summer! Regardless of results, though, this team is very fun to watch. And they’re holding on to that chance! Even when they don’t quite look like themselves, I love this crazy team!